Journal of Anesthetics and Anesthesiology a newly launched Open access, Peer- reviewed Journal which will be dedicated to submission of manuscripts in the field of local anesthesia, sedation, regional anesthesia, anesthetic agents, cardiac anesthesiology, nerve blocks, spinal, epidural and caudal anesthesia, general anesthesia, vasular anesthesiology, thoracic anethesiology, pediatric anesthesiology, obstetric anesthesiology, analgesics, spinal anesthesia, anesthetics, clinical anesthesia, dental anesthesia, vascular anesthesia, surgical anesthesia, anesthesia drugs, pediatric anesthesia, cardiothoracic anesthesia. Journal is directed to fundamental practices of anesthesiologists to permit surgery of a patient without responding to analgesia during surgery. The core of the journal is to publish original research, review articles, clinical cases, perspective, commentary and others which provide broad sense of information on perioperative, critical care, and pain medicine in the field of Anesthetics. 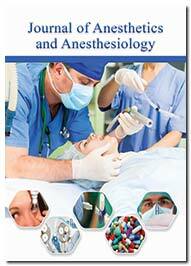 The mission of Journal of Anesthetics and Anesthesiology is to provide the readers with the novel information and latest advances in the field of anaesthesia. The principal criterion for publication is potential impact on patient care. Journal of Anesthetics and Anesthesiology is an open access journal designed for the wide dissemination of research in this field to worldwide audience. New developments in methodology and techniques are important resources for the research community. The journal scope encompasses the knowledge in medical research of the topics related to anesthesia practice, airway management, anesthetic administration, preoperative and postoperative considerations, pain management, inhalational anaesthetics, topical anesthetics, General anesthetics, Local anesthetics.